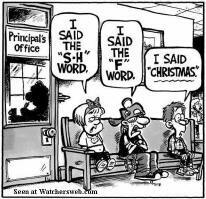 « Politically Correct or Off BeaM? Along with Hitler, Gandhi, Stalin and Martin Luther King, the former prime minister has been dropped from a list of key figures to be mentioned in history teaching. This means pupils may no longer hear about his stirring speeches during the Second World War, when he told Parliament that defeating Hitler would be Britain’s “finest hour”. Critics warned traditional subject disciplines were being stripped of key content and used to promote fashionable causes and poorly-defined “life skills”. Hmmm..friends ..do y’all detect a bit of “tinkering” by politically correct trendies? More government interference in schools here and abroad. Ah yes, revamp and relaunch a curriculum devoid of any historical knowledge, except for Muzlim history no doubt..I wonder what their version of Izlamic tyrannical governments are. Would you not think that the Brits should be proud of the way they stood up to the abomination of the Third Reich. Let’s see…is it more important to teach the Revolutionary War or how to manage a mortgage. Our Lefties are churning out generations of children who are barely literate, unemployable due to a lack of basic skills….but imbued with the alleged “knowledge” and guilt that they are destroying the world. Global warming anyone? Don’t teach about the two World Wars. Don’t talk about the Holocaust. It may “offend” some sickoes. Don’t mention Ronald Reagan or Winston Churchill. Don’t dare cite “Santa Claus”. but heck..have Muzlim Day!..where children can “learn” all bout differences and respect. Ha. Sign up for your new classes propaganda kids! Heck. and teach them in A-rabic instead of English while your’e at it. If you don’t even know where you came from, how can you possibly know where you are going? This is an insult to everyone who fought or died trying to save the free countries we live in. What say Y’all sweet friends? This entry was posted on Friday, July 13th, 2007 at 12:45 pm	and is filed under Angel's Musings. You can follow any responses to this entry through the RSS 2.0 feed. Both comments and pings are currently closed. another vote for private school or home school! The largest tank battle in history was the Battle of Kursk, which took place during World War II and concluded on July 13, 1943. 6,000 tanks took part in the fighting (along with 5,000 aircraft and approximately 2,000,000 soldiers). The National MSM can be just as dumb as the locals…. Thats horrible.Wish they would stop interfering in the school systems. I went to a Methodist school and they taught what they wanted as opposed to the public schools.There was only one girl who had a problem singing “Oh Jesus I love thee…”She was Muslim!! She had a choice to leave though!! Jesse (wheres my children)Jackson and Louie (need more moose in my hair)Farrakhan. In support of the 2 Policemen shot by the ” non-white” attempted murderers in New York City..
please post immeadiately when information is released…..
meanwhile i will go back to watching that “snowball in Hell” do its thing. I am with you hun! Have a great weekend. Road map? What road map? Ouch! You hit a hot-button subject with me. I’m so sick of the mess the lefties are trying to get us in that I could rant for a week. But I’ll be nice and just say that we need to start by getting rid of the socialist/communist tenured professors in our colleges and universities and replacing them with some good conservative red-blooded Americans. I was away for a few…did i miss the call to protest guns in the hands of “non-white” by the three stooges…do indeed wake me, when it starts. Perhaps someone will ring Al’s (sean) bell and the march will begin..
Wow! I am in favor of some of things proposed, but this is not an education so much as indocrination. While the arts cannot be separated from politics; science, math and history should. Nice post! The left is irrational, in any case. That ideology is tied to ignorance. Great post! I’d only add that not only are Leftists basically mental midgets and morons, they also have no sense of humor! and in San Diego they are trying to make special concessions for Muslims by providing prayer rooms in the public schools (Christian Prayer, of course, is still not acceptable). it seems there are at least five incidents of “mishandling” of the Koran at Gitmo. Good post. I heard this story on the evening news and I could not believe what I was hearing. Next thing you know, WWII will just be a couple of sentences in a lesson plan. I still can’t figure out this trackback thing, I linked the thread, what else do I do? Drop me a line if you can help, Angel. Weekend open trackback! Leave a trackback of your best post for others to read…. I followed you here from Obob’s. A virtual plethora of topics you have here! Kudos. You just gave all the reasons for why i have home schooled all four of my children! Hi Angel. I got here a bit late, but at least I got here! Great post, but I’ve come to always expect that of you. 14 Reasons to Deport Illegal Aliens…$$$$’s…. Nothing like a hot woman in a patriotic bikini! These thieves never heard my father’s old adage- “If you’re going to steal, steal big. Because whether its big or small, when caught you’re going to jail.” The $742 that Todd Zislin stole probably doesn’t look worth it to him in retrospect now…. The level of contempt that Rep. David Obey (D-WI) Chairman, House Appropriations Committee has for the American taxpayer is both galling and stunning. He considers $29 billion in pork-barrel spending unimportant and the stories about fraud and wast…..
Just before five teenaged girls died in a head-on collision with a truck, text messages were being sent and received on the drivers cell phone…. Absolutely insane. As a history teacher and Anglophile, I cannot imagine not including Winston Churchill, etc., in history classes! our son is so militant – he’ll wear nothing but rightwing/religio tee-shirts at ALL times – he’s worried in the past that he may be sent home from school for them until we came up with a solution: take the tee off and turn it inside out! so far he hasn’t been confronted, but we do live in the conservative south. big brother hasn’t yet heard of us. I confess. The supreme arrogance and idiocy of Paris keeps me running stories about her long after she really deserves it. But it just kills me what is coming out. Today’s winner is Broward Circuit Judge Charles Kaplan…. If the implications weren’t so darn serious, it’d be almost interesting to see how far the Brits can limp along without teaching their kids to take pride in their country…. Carbon offsets are becoming Big Business these days. It does not matter how much energy you use, how much fossil fuel you burn, how much Carbon Dioxide you return to the atmosphere. All you have to do is purchase a Carbon offset and you have compensa….. Suggestion to Fred Grady of Holland & Knight- Grow up and get your own blog. If you want to throw a temper tantrum throw it there. You can do it anonymously without causing further embarrassment to your son…. A satirical piece by Scott Ott raises a serious point about withdrawing from Iraq. There is no easy way out. We either fight the war in Iraq now, or we’ll be forced to fight a much larger war later. This past weekend I saw a section at the Barnes and Noble bookstore. It was titled, “New History.” And no, it wasn’t near the fiction section. The liberals press on to new lows. Nothing they do shocks me anymore. It just makes me angry. They don’t even teach about LaFayette in school. He heard about Americans wanting freedom from tyranny, and at a young age the Marquis decided on his own that freedom was worth fighting for, and he pledged his support, putting his life on the line. Here he was, a young nobleman, fighting for democracy! Most people don’t even know we were LOSING the revolution until he showed up and spent his family fortune paying for troops, ships, and weapons. If anything is taught, even in college, it is that France didn’t like England, so they supported us, which is bogus. France didn’t want anyone bucking the monarchy system, even if it was England, because it threatened their own stability. They threw LaFayette in jail when he went home. They don’t teach how he fought alongside Washington, and was wounded in battle. Bottom line, they don’t want anyone learning that one man CAN make a difference. They don’t want you learning about the truth, the struggles involved with preserving freedom, or anything except whatever watered down PC nonsense they can get away with teaching to create generations of sheep willing to blindly follow and support whatever corrupt freedom-stealing legislation our so-called representatives push for next. Yes, our schools now teach the students that they are an accident, there is no Creator, they are just here by a whim of nature, and when they die, they become just so much compost. They teach them that good is evil and evil is good. They teach them that there is no hope for the future. And then they feel it’s necessary to teach classes on how to improve their self esteem. Mark, nothing is wrong- everyone is right, except Christians! That’s what they teach in Moral Relativism 101 between homosexual appreciation class and muslim prayer time! Healthy eating is fine… but good grief! Churchill saved their butts.